Epson is a popular brand of printers that has its own following so when it comes to multifunctional printing devices, enthusiasts will, definitely, consider choosing from the Epson All-In-One Printers 2011. With these printers, you not only get great photo quality, but also more advanced features and functions like copying, scanning and faxing. Basically, the devices presented in Epson All-In-One Printers 2011 will not fail to catch the eye of techie users with their unique, stylish designs, not to mention the high quality performance they provide. 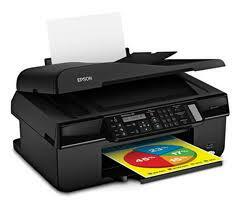 Epson WorkForce 310 All-In-One Printer is a cool, all black, compact device that prints,copies, faxes and scans. Though it is an entry level printer that comes with a very affordable price, it performs very well. It provides prints with laser quality at a fast speed of 16 pages per minute for mono and 5.5 pages per minute for color. It has built-in Ethernet with wireless networking capabilities that allows printer sharing among multiple computer users. This printer allows you to fax directly from your computer, making you save on paper. It has a high-speed faxing of 3 seconds per page for both mono and color. It, also, comes with speed dial storage of up to 60 numbers and a fax memory of 180 pages. Epson WorkForce 310 All-In-One Printer is simple to operate. It is convenient to use with its 30 page automatic document feeder which makes you, easily, scan, copy or fax. Prints are smudge proof, fade proof and water resistant. It is capable of automatic duplex printing that lets you save on 50% of paper. Epson WorkForce 600 is an all-in-one printer that prints, copies, faxes and scans. It includes a 2.5” LCD screen. It prints 2 times faster than similar models in the market. It has a draft speed of 38 pages per minute for both mono and color. For laser quality, it prints at 27 pages per minute for mono and 19 pages per minute for color with a resolution of 5760 x 1440 dpi. It has built in WiFi and Ethernet networking for sharing among work groups. It uses extra high capacity ink that gives more prints. It has a 30 page automatic document feeder. It includes memory card slots. Epson WorkForce 610 All-In-One Printer is ideal for a small business or a home office with its functions as a printer, scanner, copier and fax machine. This brand claims it to be the fastest among printers of the same price range, with its rapid speed of 38 pages per minute. Another feature to admire about this printer is its ability to refresh old photos with the help of its Durabrite inks and on-board software that enhances them with color correction. It has a 30 page automatic document feeder that is convenient to use. Epson WorkForce 610 All-In-One Printer includes a LCD that makes it easy to view or edit photos before printing. With this device, you are able to scan and save documents to either your USB drive or memory card. Epson Stylus NX400Printer is an affordable all-in-one printer that you can rely on with its exceptional quality of print. It can print at a fast speed of 34 pages a minute for both mono and color and can print 4” x 6” borderless photos in 26 seconds. It includes a 2.5” LCD display for easy navigation of pictures to be printed. It comes with a scanner bed, Pictbridge and other built in memory card slots. Since it makes use of Durabrite inks, you can be assured of photos that are resistant to water, smudges and fading. All devices featured in Epson All-In-One Printers 2011 perform well in the functions they provide. Epson WorkForce 310, Epson WorkForce 600, Epson WorkForce 610 and Epson Stylus NX400 All-In-One Printers have fast print speeds, high resolutions and additional features such as networking, duplex printing and automatic document feeders. All these provide efficiency and convenience of use making them a worthy investment for home office or business use. Simply click here to return to Epson Reviews.